Travelling abroad this summer? We offer a full travel immunisation service. For more information about how our Appointments system works, view our Appointments page. Access a Doctor or Nurse out of hours at one of four Leicester City Healthcare Hubs. We offer a weekly clinic run by our Practice Nurses which offers guidance regarding management of diabetes, prevention of complications and all related issues. Annual clinics screening older men in conjunction with Leicester Royal Infirmary. Annual clinics for patients with diabetes, run by ophthalmologists from the Leicester Royal Infirmary. These are recommended for all patients aged 40 – 74 and are carried out by our Health Care Assistants. Mammograms are offered every three years to all our female patients aged 50-65 years. Patients in this age group will be contacted automatically and will be given an appointment at a screening centre. You will be notified of your results by post. Run twice weekly by our Practice Nurses to monitor patients taking anticoagulant medicine. A number of minor operations are undertaken by our doctors. 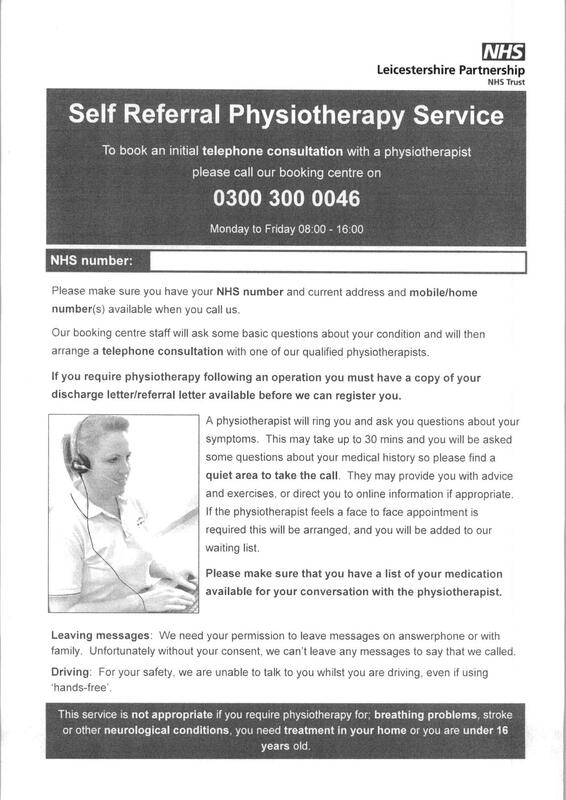 Please view the Self Referral information.